Discover the Secret to Making This School Year Incredibly Exciting AND Fun with an Assembly Program That Has Students, Educators and Parents RAVING! We had Paul come out and perform his Magic of Recycling show for us. The audience LOVED it! They were Educated and Entertained about Recycling and the Environment! I would highly recommend him to anybody! I just wanted to thank you so much for coming into my classroom. The kids really learned a lot and had so much fun! I hope you enjoy all the thank-you notes the kids made for you. You definitely impacted their lives. My name is Presto Paul. 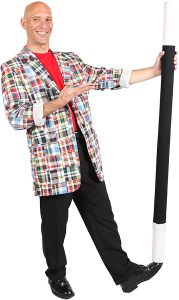 I am a professional magician who specializes in creating educational programs for elementary schools! I combine Education and Entertainment that makes an impact. It’s no secret, if you’ve been an educator longer than one day, then you’ve found out one universal truth… children learn better and retain more if they are engaged. There are so many other things grabbing their attention and they “tune out”. To make things worse children see their peers, friends and family members “tuning out” at the first chance they can get. What are kids to think? Be Educated And Entertained At The Same Time! My Amazing Assembly Programs will motivate, inspire and educate your students in a way that has to be experienced to believe! Your school will be able to fill all it’s assembly requirements with just one call. Each program focuses on topics that parents and teachers know are the most important for your students. Make this school year the most Amazing one that your students will never forget with my Amazing Assembly Programs! "All the kids had an Awesome time! Paul was Rockin’! Everyone enjoyed him and asked for him to come back!" For more details about my entertaining and educational programs, as well as pricing, simply fill out the form below. If you have any questions, feel free to contact me at 859-803-1655. Finally, a program that is so easy to book that it’s ONLY a Click Away! Your kids are worth it!